I have received a complimentary test from Living DNA, and the results I am reporting here are based on testing done on the new Illumina Global Screening Array. 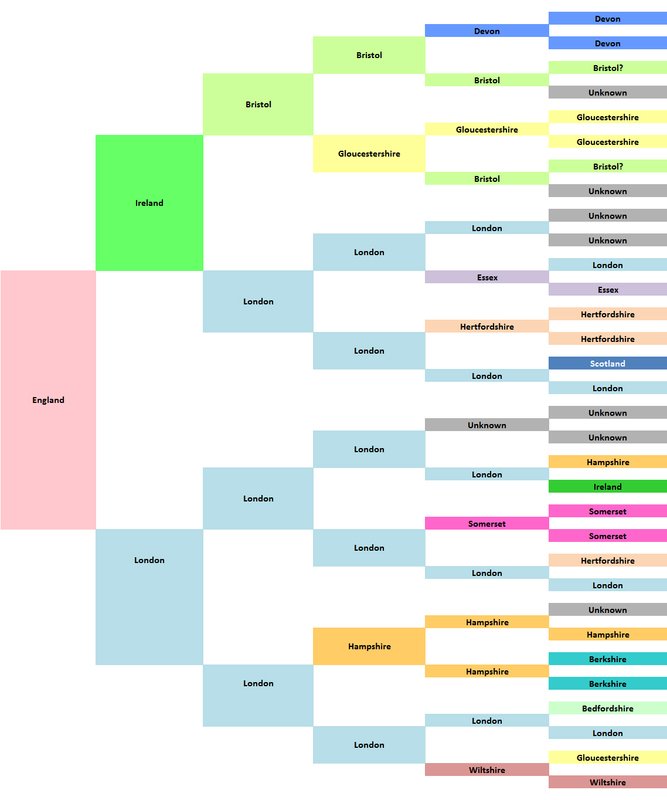 In this article I will focus on the family ancestry maps. I will write about other aspects of the test, including the Y-DNA and mtDNA reports, in a separate blog post. Only a handful of people have received their results so far, and I'm privileged to be one of the first people to receive results from this new test. Further results are slowly being rolled out but most people won't get their results until early or mid-February. Cautious - Similar populations are grouped together "in order to provide the highest certainty of results possible". Standard - The company highlights "the sources of your ancestry estimate that they are most certain about. Ancestry that cannot be attributed to one of these sources is shown as being "unassigned"." Complete - This provides their "best estimate of your overall genetic makeup". Currently only the standard mode is available. The complete and cautious modes are due to be released in late February 2017. The family ancestry maps show me the areas of the world where I share my genetic ancestry in recent times (4-5 generations). Update 17th February: The time frame has now been updated and my results page now states: "Your family ancestry map shows the areas of the world where you share genetic ancestry in recent times (10 generations)". Here is my map at the global level which shows that 98.4% of my ancestry is from Europe with 1.6% unassigned. By clicking on the + symbol I can access the submenu to view my genetic ancestry at the regional and subregional levels. 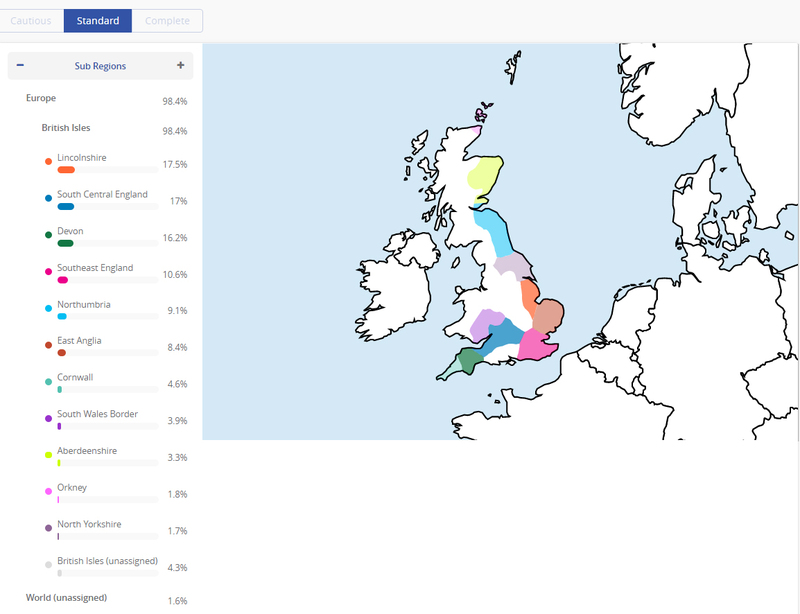 Here are my regional results in standard mode which place 98.4% of my ancestry in the British Isles with 1.6% unassigned. In my case the global and regional maps are identical because all my recent ancestry is from the same place. This is a full list of the 21 regional groups within Britain and Ireland identified by Living DNA: Aberdeenshire, Central England, Cornwall, Cumbria, Devon, East Anglia, Ireland, Lincolnshire, North Wales, North Yorkshire, Northwest England, Northwest Scotland, Northumbria, Orkney, South Central England, Southeast England, South England, Southwest Scotland and Northern Ireland, South Wales Border, South Wales, South Yorkshire. Descriptions of the regions can be found here. As can be seen, the birthplaces of seven of my 32 great-great-grandparents are unknown. I have four great-great-great-grandparents who were born in London, and two who were possibly born in Bristol. People mostly migrated to Bristol from the West Country and Wales, but ancestors who lived in London could have come from anywhere in the country. According to one estimate "one in every six English people either visited or lived in London at some stage in their lives during the early modern period" and London was also the major destination for immigrants from continental Europe (Hey 2004). Identifying the origins of ancestors in big cities like London and Bristol is often difficult unless they happen to have survived until 1851 so that their birthplace is recorded in the census. My genealogy is probably not ideal to be used for a comparison because I have so many unknown and London ancestors. However, I was very pleased to see that my Devon ancestry was reflected in my results. The average amount of DNA inherited from a great-great-grandparent is 6.25%. My Devon ancestry has come out at 16.2% which is higher than expected, but it could be that some of my unknown ancestors are from Devon. This high percentage might also reflect my Somerset ancestry. Somerset is not identified as a specific region with the Living DNA test. I was intrigued by the 1.7% from South Yorkshire. One of my London ancestors, my great-great-great-grandmother Elizabeth Horton, was born c.1806 in Hackney. I have some matches at 23andMe with a couple of people with the surname Horton in their family trees who have ancestry from Yorkshire. I've since discovered that Horton is a Yorkshire surname. This is a case where DNA testing has the potential to be used to inform genealogical research. I don't have any documented ancestry from either Wales or Cornwall but these percentages could be explained by my Bristol ancestry. It's also important to remember that ancestry is not strictly defined by country or county borders. For example, during the nineteenth century many people from Devon moved to South Wales to work in the coal and copper mines so you could have people with four grandparents born in Wales who actually have a lot of ancestry from the South West. Conversely there are a lot of Welsh patronymic surnames that are found in North Devon. I do not have any ancestry assigned to Ireland with the Living DNA test, whereas at AncestryDNA I came out with a surprisingly high percentage of Irish ancestry (20%). Living DNA are currently recruiting people with four grandparents born in Ireland to improve the Irish estimations so it may be that my results will be updated in the future and my Irish ancestry will be reflected in my results. The big surprise is the high percentage (17.5%) assigned to Lincolnshire though I'm told that the region labelled as Lincolnshire also extends into North London. The Lincolnshire component could possibly be a reflection of my ancestry from Bedfordshire and Hertfordshire, two counties to the north of London that are en route to Lincolnshire. Alternatively it might perhaps be a clue to the origins of some of my unknown ancestors or it could represent deeper ancestry. It's very easy to speculate but with any DNA test it's important not to take the results too literally and to interpret the results in combination with the genealogical evidence. The rest of my results broadly correlate with my known genealogical ancestry, though I have come out with more ancestry from the north of England than I expected. Although I've only focused on my own results, Living DNA can also provide regional breakdowns for other countries, though not currently with such fine-scale resolution as for the British Isles. For example, in one set of results I've seen for a British individual with some Italian ancestry he was assigned ancestry from Southern Italy and Sardinia. Jewish and Aboriginal ancestry is not currently covered by Living DNA but should be added in the future. We can expect to see the results change over time as more studies are published and more reference populations are added to the database. A comparison with my results from other companies. I also have biogeographical ancestry results from 23andMe, AncestryDNA, Family Tree DNA and GPS Origins. 23andMe aims to provide a representation of our genetic ancestry within the last 500 years. My speculative results at the subregional level match 56.1% of my ancestry with Britain and Ireland. 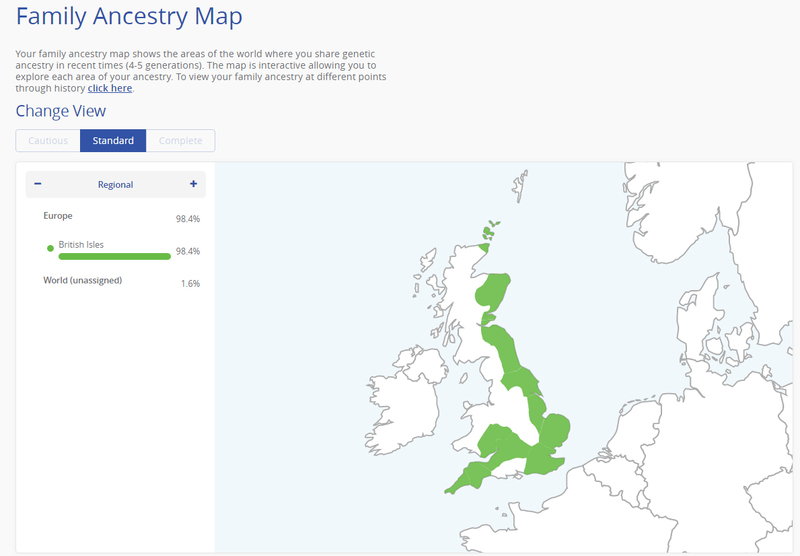 At Family Tree DNA the MyOrigins results from my Family Finder test match 57% of my DNA with the British Isles. FTDNA do not give a timeframe for their results. At AncestryDNA 21% of my DNA is matched with Great Britain and 20% is matched with Ireland. AncestryDNA do not claim to show genetic ancestry within the last 500 years and state that the results can "reach back hundreds, maybe even a thousand years, to tell you things that aren't in historical records". The Irish component of the AncestryDNA test seems to be elevated in people of British ancestry, and the Irish cluster actually extends into Wales and Scotland. Most English people are coming out with at least 15% "Irish" at AncestryDNA. For further details see the AncestryDNA blog post What does our DNA tell us about being Irish?. For a detailed comparison of my results from 23andMe, Family Tree DNA and AncestryDNA see my blog post Comparing admixture results from AncestryDNA, 23andMe and Family Tree DNA. The GPS Origins test does not have any British or Irish components and instead matches 19% of my ancestry with Fennoscandinavia, 12.9% with Western Siberia, 12.4% with Sardinia, 11.8% from Orkney, 11.3% with Southern France and 11.2% with the Basque Country, with smaller percentages from other regions. For further details see my blog post A review of the GPS Origins tests: four ethnicities and four reports. The Living DNA test has given me the most accurate results of all the biogeographical ancestry tests I've taken so far, placing 98.4% of my ancestry in the British Isles which is a true reflection of my documented ancestry within the last few hundred years. For the first time I have been given a subregional breakdown of my results which shows the regions within Britain where my ancestors possibly lived in the last few hundred years. Because I have lots of ancestors who went through the melting pot of London and Bristol my British ancestry is very mixed as people migrated to these cities from across the country. This also makes pre-1837 research in big cities before the beginning of civil registration in England and Wales very challenging. I also have some gaps in my family tree because of illegitimacies. However, my Living DNA results correlate very well with what I have been able to document about my ancestry, and might even have provided me with some clues to break through some of my brick walls. I was particularly pleased to see that my Devon ancestry had been picked up and was intrigued to see the small traces of my possible Yorkshire ancestry. My results only provide a sample size of one and it is very easy to interpret results post hoc and make them fit with your expectations so I shall be very interested to see results from other people, and especially people who have more defined ancestry than me from specific regions. Biogeographical ancestry testing has entered an exciting new era and we now have a test that provides a fine-scale breakdown of our genetic ancestry at a subregional level. Living DNA updated their algorithms in June 2017 and released the family views feature providing cautious, standard and complete views. See my article My updated family ancestry maps from Living DNA. Received my Living DNA autosomal test results - post 1 by Randy Seaver, Geneamusings, 10 January 2017. My DNA: Living DNA results by Emma Jolly, 14 January 2017. My Living DNA result has arrived by Donna Rutherford, 1 February 2017. Living DNA - my early results are in by Paul Brooker. Journals of a Nonconformist, 30 January 2017. Living DNA results by John Reid. Anglo-Celtic Connections blog, 3 February 2017. My Living DNA test results by Philip Grass. Learnalittleeveryday, 14 February 2017. The new Living DNA test: a review of my results by CeCe Moore. Your Genetic Genealogist, 16 February 2017. A slight sidetrack - my Living DNA results by Barbara Griffiths. Not Just the Parrys, 19 February 2017. St David's Day DNA by Ancestral Wales, 1 March 2017. Living DNA: I'm not who I thought I was by Jane Roberts, Past to Present Genealogy, 28 June 2017. Hey D (2004). Journeys in Family History. London: The National Archives, p.183. Well Debbie, this is quite a pleasant surprise. Although I only knew (vaguely)of your English roots, the breakout and analysis you give here is quite illuminating. You and I have shared thoughts about POBI and of late GPS Origins. This however seems to be several steps forward. I'm thinking about taking this test now and will measure results against N. Yorks and Warks. It'll interesting to compare! Debbie I have members of my ONS who moved from Lincolnshire. Some went to Surrey but there are also some who went to Bristol. I am trying to decide what would be the best DNA test for me as I have not found any ancestors that were born outside England. I would rather pay more for one test which might help with problem areas than have to do several to get useful information. Will watch this with interest. It will be interesting when some American results arrive from folk who are not too admixed over there - the white Anglo-Saxon Protestant ones. This does seem to have potential for folk whose ancestry over here is really unknown - whether it can reach back effectively before about 1830 will gradually become apparent. Shall I ask my family to buy it for me for my 70th birthday? Thank you Larry for your kind words. Do let me know how you get on if you do decide to take the test. Hilary, If you only want to take one test I would suggest taking the AncestryDNA test. They now have the largest database, and more British people in their database than any other company. In the long run you should be able to transfer your AncestryDNA raw data to both Family Tree DNA and Living DNA where you will be able to pay a small fee to get your results. The FTDNA autosomal DNA transfer program is not currently working but I hope it will be restored very soon. Living DNA haven't yet announced that they will accept transfers but it is in the works and hopefully it will be possible in the next few months. Brian, I think it will be interesting to see how the Living DNA results work out for people from different populations. I suspect the Americans will probably have fewer clusters than British people as their ancestry tends to have been sourced mostly from specific regions such as the South West and East Anglia. The settlers often came from the same area and then tended to marry people within their own community in their new land. You might want ask for a test for your birthday. You will get slightly better results with a new test on the new chip rather than from a transfer. Debbie, thanks so much for this! Do you think Jewish ancestry will be reported as unassigned, since it isn't currently covered at Living DNA? I wonder if Ashkenazi is what is meant by "Jewish," or whether they will not cover Middle Eastern DNA as well. Supposedly I have both from my one Jewish parent (according to 23andMe and FTDNA, anyway). I know you don't know the answers to all these questions! I'm mostly just musing on it, fascinated to see what happens. Thanks again. Excellent article Debbie. 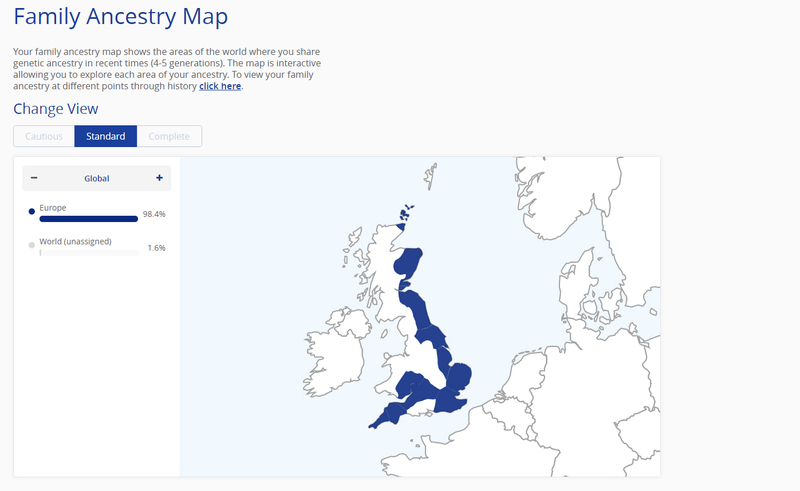 With Ancestry showing me at 87 % British Isles, it will be nice to see the Scottish and border reviever stuff come out. I'm afraid I don't know what to expect for Ashkenazi DNA. I believe there are reference samples from the Middle East so it might well show up as Middle Eastern. We'll need to wait until we see some more results. Claire, I hope the Ancestry transfers will be available in the near future. With the AncestryDNA tests British people seem to get varying percentages of Great Britain, Western Europe, Scandinavian and Irish. Your results are not unusual. I've seen some people with all English ancestry come out with 0% Great Britain. Interesting post. I've tested with Ancestry, 23andme and am currently awaiting results from FTDNA. I've also uploaded my data to DNA.Land, Wegene and DNA Tribes. I'm thinking about taking this one when I have the money, would be interesting to see what it comes up with. Paper trail wise at the 3x great grandparent level I'm 31.25% London, 25% Mauritius, 18.75% Dorset, 6.25% Netherlands, 6.25% Hampshire, 6.25% Somerset, 3.125% Berkshire, 3.125% Buckinghamshire. My European mostly falls into whatever broad North Western/Western European category the site has. 23andme has me at 23% British & Irish, AncestryDNA 10% Great Britain, 14% Ireland. I have been sent a link to this from a friend - who like me wants to get tested for her female line but we can't decide what would be best for our situation. I cannot get DNA tested for my direct male line which I have traced back to 1598 (fully documented and all in North Yorkshire) because I have no living male relatives. 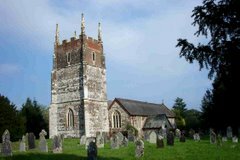 On my mother's side I have traced my direct female line back to my 5 x gt grandmother who lived in Dorset, married around 1765 and would have been born about 1746. She is my brick wall as I do not know her maiden name. Although I have a general interest the the make up of my DNA, would this company's test be able to help with this - particularly as I am looking at 7 generations before me and the early to mid 1700s. Thank you for any advice you are able to give. For mtDNA it's best to test with Family Tree DNA. They're the only company that have an mtDNA matching database and they're the only company that offer a full mtDNA sequence test. The Living DNA test will give you a haplogroup assignment (your branch on the mtDNA tree) in addition to the biogeographical ancestry report, but these mtDNA results can't be used for genealogy purposes. For genealogical DNA testing the testing needs to be done with a company that offers a matching database. Living DNA don't currently have a matching database though the reports are interesting and can potentially provide clues about your origins. An autosomal DNA test is probably the best starting point because the autosomal databases are now very large. However, autosomal DNA is really best used for confirming relationships within the last five or six generations, and is difficult to use for more distant relationships. This is because of the random nature of autosomal DNA inheritance but also because of the limitations of genealogical research. Few people can fill in all the boxes on their family tree for six or seven generations. For autosomal DNA I would recommend testing either with AncestryDNA or with Family Tree DNA (the FTDNA test is called the Family Finder test). Regarding Ancestry's identification of Irish roots, I have been told by a friend who attended a talk at a family history fair that by Irish they mean Celtic. I have no known Irish ancestors in the last 200 years, but Ancestry show my Irish component almost as large as my British. The paper trail shows I am mostly Welsh. Looking forward to seeing what Living DNA say next month. Fascinating! I'd love some solid genetic leads on my English ancestors, many of whom came to the US in the late 1600s. That's 8 generations back for me. If 500 years back is possible, that sounds about right for getting back across the pond. It's good to see you found the results fairly accurate. I am looking forward to when they add the results of the The Irish DNA Research Project to expand beyond the currently included Northern Ireland. As my expected break-up would be 50% Aberdeenshire, 25% - 37% Ireland and 13% - 25% England it will be interesting to see how this is reflected by Living DNA. I read somewhere that the best transfer results are from 23andme. So does this mean they would be accepting transfers from AncestryDNA and family finder as they wouldn't be accurate. Living DNA had access to my raw data files from 23andMe, Ancestry and FTDNA. They said they got the best results from 23andMe. The best results are obtained from testing on the new chip. The company are doing some comparisons and I will publish those when I have all the details. The test will give regional breakdowns for other countries but not with such fine-scale resolution as for the the British Isles. That's because no other studies like POBI have been published with such careful sampling. Hopefully that will change. Really interesting, Debbie. Unlike yours, my Living DNA results show NO southwestern Britain DNA at all. I'm totally Central and Eastern Britain with a bit of North Eastern, South Eastern and a little North Welsh. I assumed it meant my ancestors came over with the Danes as the border of my DNA area matches the Danelaw border almost exactly. But when I got the booklet, it made it clear that the Norse/ Danes had little DNA effect on Britain, it was the Anglo Saxons who left their mark. 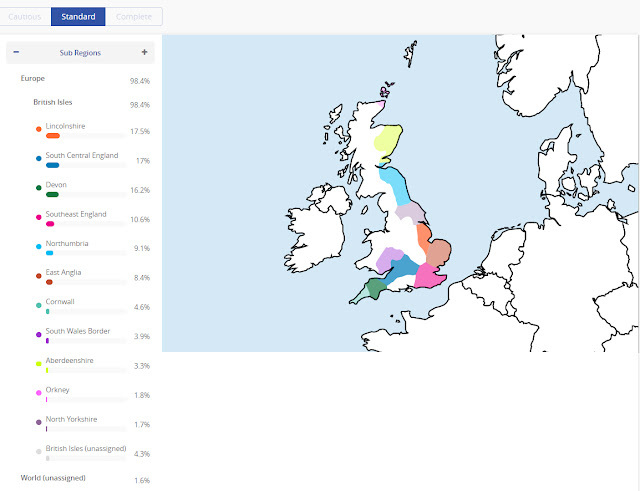 So as I'm 25% from Central England, its almost certain I am Anglo Saxon, probably like most native Brits. I read something about the Anglo Saxons deliberately trying to outbreed the native Britons, do you know if that's true? The Living DNA test is supposed to reflect your ancestry within the last five to ten generations. The conclusions about the Norse and the Danes were from the People of the British Isles research. What we really need is a lot more ancient DNA from Britain to answer these questions. I have read your comments on your LivingDNA results with interest, I have just submitted my sample and look forward to the results. In particular 80% of my ancestors to 3G Grandparent level were all born in North Yorkshire with an unknown branch as my maternal grandfather had no father recorded on his birth certificate. When the results become available they may shed some light on that unknown branch. John, Good luck with your test. I'd be interested to know how your results turn out. The Living DNA test might possibly provide some clues but if you're trying to trace an unknown grandfather I would suggest you get tested at AncestryDNA and then do the transfer to Family Tree DNA. Both these companies have cousin-matching databases. If you are fortunate to have matches with cousins on this unknown lineage you might be able to determine the identity of your unknown grandfather. Hi Debbie, as you may be aware Living DNA has revised its results and released Cautious and Complete modes, I'd like to see how it re-assigned your DNA results and what you think of the new modes.. would you consider posting about that? I will be blogging about my updated results. I've just got back from three weeks in the US and I need to work my way through my backlog first! If you have a sibling who tested O dare say their results will be different than yours. My aunt at Ancestry is 100% Great British while her sister is only 48% Great British. Doesn't this make further nuance from the standpoint of more 'granular ' DNA testing as well as pedigree analysis rather superflous? For pedigree analysis it's best to used the cousin-matching results. Living DNA should be launching a cousin-matching service later this year. The ethnicity reports can provide some clues about ancestry but it's best to focus on the larger percentages. Hi, Debbie--Yes I understand that siblings won't show the same ethnicity percentages. What I question is this: Say each couple of your 32 4th great grandparents has a different (and exceptionally'pure') ethnic origin, ie. there are 16 different ethnic origins at the level of your 4th great grandparents. Do you maintain that your ethnicity results would be expected to show 6.25% of each of those ethnicities? This seems unbelievable considering how DNA is randomly passed down. (Incidently, I purchased a Living DNA kit for the aunt I mentioned who showed 100% Great Britain to see if greater 'nuance' would ensue). dB, In the scenario you describe (which in any case is extremely unlikely) you wouldn't expect to get exactly 6.25% for each set of 4th great grandparents. Inheritance is a random process. We can inherit 20% of our DNA from one maternal grandparent and 30% from the other maternal grandparent. These differences become much more distorted the further time back in time we go. It may well that if you had say one set of African gggg grandparents you might get a percentage of this African DNA and a sibling would get none or a much lesser amount. I will take this test to help with assigning my english roots to areas of england I have taken Myheritage and Ancestry and this has helpeda little so far the problem and also the greatest help is that my Ancestors came to NZ and Australia from small counties before people drifted into the cities so apart from 1 Great great and one Great Grandparent Born in NZ and 1 great great Great and 1 great great born in Australia all my Grandparents were born either in Australia and New Zealand which helps as lots have tested and I have a mishmash of relations interrelated which can help and hinder in trying to work out the different family relationships. I am in the Process of doing a 37M Y-DNA with FTDNA at the moment and this will be the next.